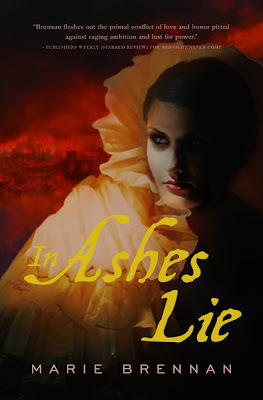 Here is the just released cover to In Ashes Lie the loosely connected sequel to last year's Midnight Never Come from Marie Brennan. 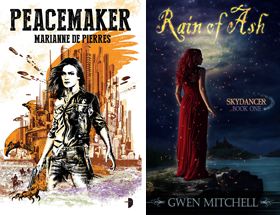 Midnight Never Come was one of the first books I reviewed when I started my blog last year and is a great historical fantasy. You can check out my very short review here. The year is 1666. The King and Parliament vie for power, fighting one another with politics and armies alike. Below, the faerie court has enemies of its own. The old ways are breaking down, and no one knows what will rise in their place. But now, a greater threat has come, one that could destroy everything. In the house of a sleeping baker, a spark leaps free of the oven -- and ignites a blaze that will burn London to the ground. While the humans struggle to halt the conflagration that is devouring the city street by street, the fae pit themselves against a less tangible foe: the spirit of the fire itself, powerful enough to annihilate everything in its path. Mortal and fae will have to lay aside the differences that divide them, and fight together for the survival of London itself . . .
Beautiful cover! I've had Midnight Never Come on my TBR shelf, since my husband gave it to me for my birthday. Thanks for the reminder! I need to move it up on my list to read. Oh very cool! I'll have to see about getting these. Midnight Never Come is on my shelf. Didn't read it so far. Need to change my reading order. The cover art continues the style from the first book and I like it. Renee I am really looking forward to this. The first book was terrific. ediFanoB kind of a dreamy look and quite different from the first book.